For those of us who love the Red Buttes Wilderness, this past summer came with some anxiety. 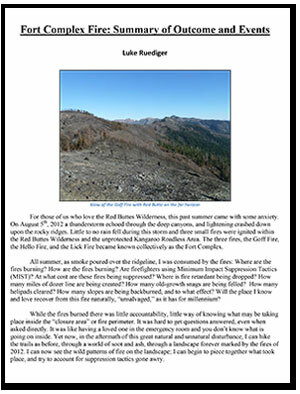 On August 5th, 2012 a thunderstorm echoed through the deep canyons, and lightening crashed down upon the rocky ridges. Little to no rain fell during this storm and three small fires were ignited within the Red Buttes Wilderness and the unprotected Kangaroo Roadless Area. The three fires, the Goff Fire, the Hello Fire, and the Lick Fire became known collectively as the Fort Complex.